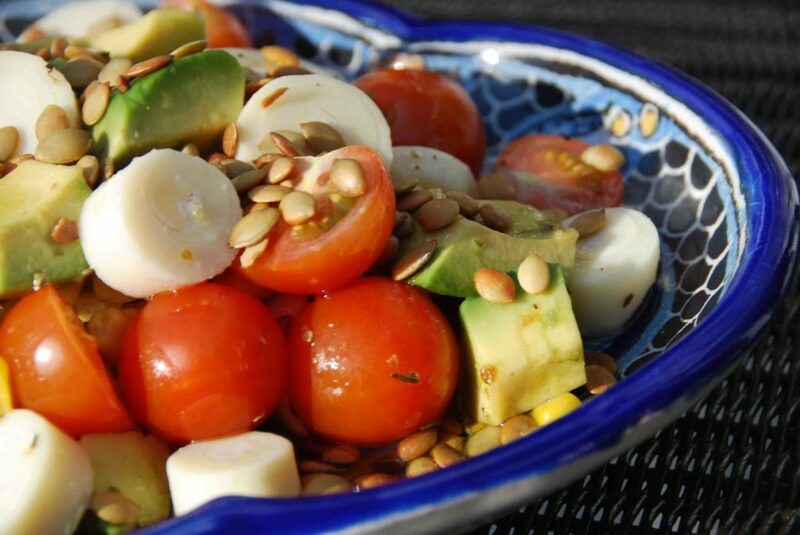 A National Public Television Series and an Avocado Chop Chop Salad: Take a Peek! I’ve been wanting to write this post for days. Every time I try, it feels like hundreds of flowers bloom in my head, clouding my thoughts. My tongue gets tied too. Which is not common. I usually don’t hesitate to express my thoughts. Dearest friends, here’s the news: if you like Mexican food, if you like Public Television, if you like my approach to cooking, then… I hope you’ll like to hear that Pati’s Mexican Table is premiering on National Public Television, this spring. I can tell you so many things about how the series came together and why I am so passionate about it. It’s been a fascinating journey: radically switching careers, launching the Culinary Program at the Institute, starting the blog, and now, embarking on the TV series. What a wild zigzag. But with each turn I’ve confirmed that I want to keep on sharing and exploring Mexican food and all that surrounds it for as long as I can. It pleases me to no end to watch my students devour the food at the Institute’s events, and more so when they write to say they’ve made the recipes at home. I love the stories you’ve shared in the blog’s comments and your requests for different cravings. I try to give you the most reliable recipe for that special cookie, dish, soup, or drink that brings you good memories or that you’ve been dying to try. Your filled and happy tummies, stories and requests, fuel my appetite to cook and share more. See… there is a side of Mexican cuisine that is yet to be fully savored and appreciated: home-style Mexican food. And for that, thankfully, many preconceptions become broken. 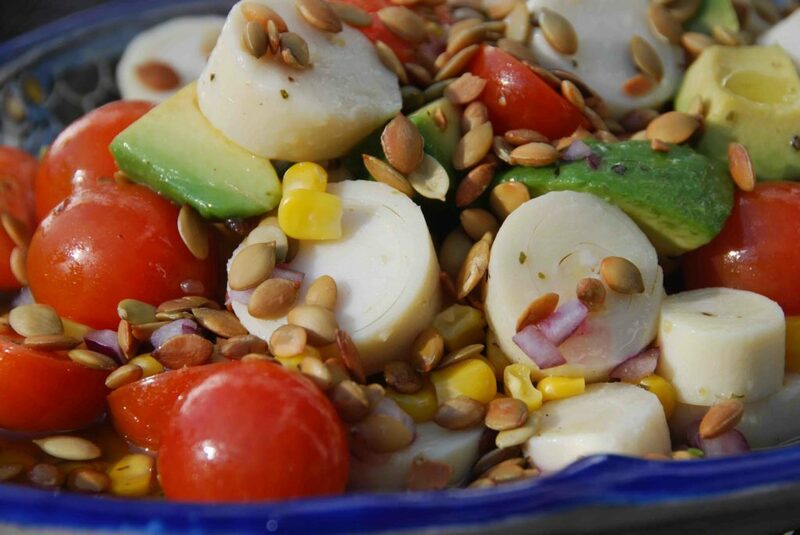 Take this Avocado, Tomato, Corn and Hearts of Palm Chop Chop Salad. One of the first recipes I thought of including in the series. 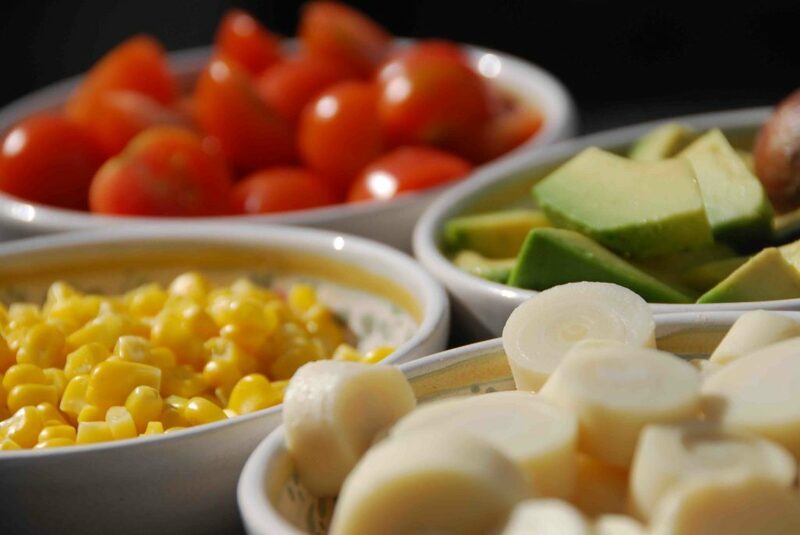 The buttery and luxurious Mexican avocados, the plump and fresh tomatoes, the sweet and crunchy corn, are all native Mexican ingredients. The hearts of palm are not, but its an ingredient that has been popular in Mexican kitchens for ages. Called palmitos, or little palm trees, when I was growing up in Mexico city, my grandmother and mother used to pair Palmitos and avocado for special occasions, just like many restaurants do. See the mix! It is colorful, it is fresh, it is wholesome. Not many adjectives given to Mexican food outside of Mexico. 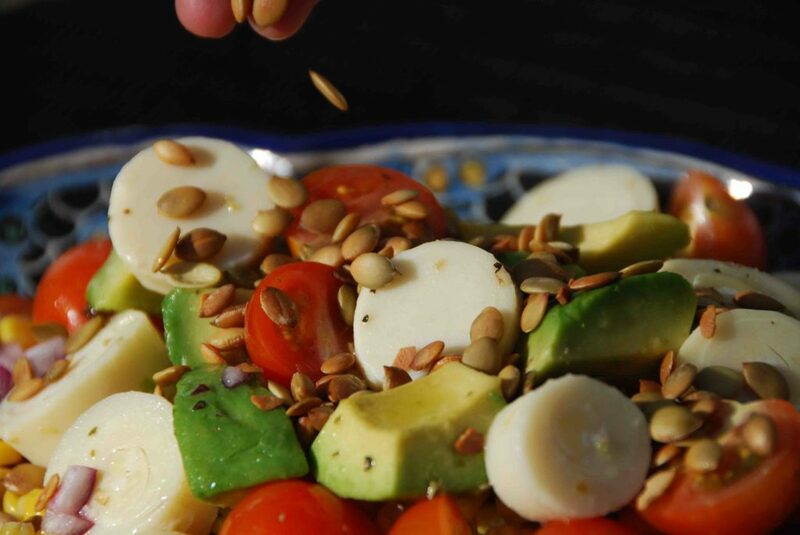 This salad is not laborious, as many consider good Mexican food to be. Ingredients here have to be simply, roughly chopped. Just like that! The vinaigrette has crisp and clear ingredients: olive and safflower oils, the always straight forward apple cider vinegar, the lively fresh squeezed lime juice, salt, pepper, oregano (commonly used to season Mexican food, though not that well known) and brown sugar to help all of those flavors shine. Simple, but layered flavors that feel so smooth when you take a bite. And no. This salad isn’t spicy. Though I am wild about fresh and dried chiles, like most Mexicans (we need them! we do! there is sooo much one can do with each different kind! ), and they are a staple in Mexican cooking (you will see some of my favorite ones in the series…) not all Mexican food is spicy nor has chiles. What gives this salad a bit of pungency is a bit of chopped red onion. There is nothing here battered or fried. Nor is this salad stuffed inside a giant tortilla with a gazillion other ingredients (OK, my boys do like U.S.-style burritos and I have come to appreciate them, but we also love Mexican-style ones… which I share in one of the show’s episodes). 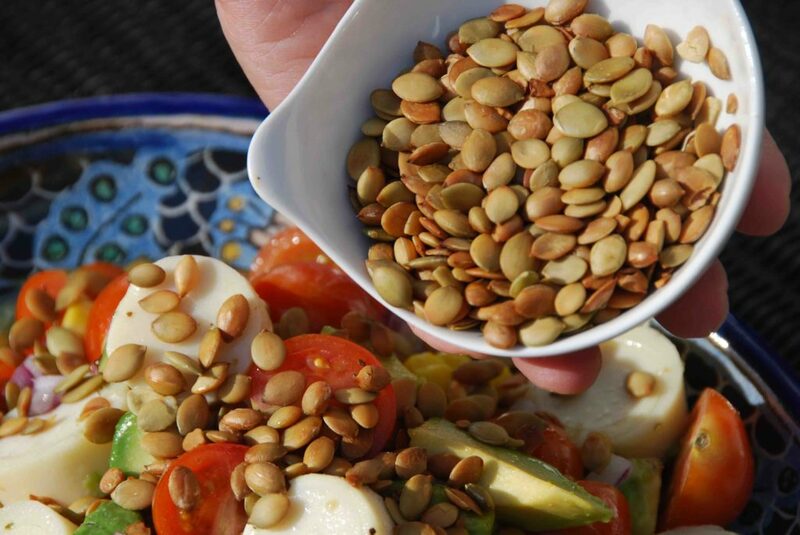 What tops the salad, and gives it a healthy, crunchy and lightly nutty flavored bite are the toasted pumpkin seeds. An ingredient that since long before the time of the Aztecs, has been the base of moles, stews, sauces and pastes. They are used for all that, and for this too. So of course I will share traditional dishes that have been passed down in families for generations, the pepitos, the soups, the tacos, the stews, the salsas, the practical moles, the flans and the panes dulces. But I will also share some of the modern spins made within the genuine boundaries of Mexican cooking: so you can explore along with me, a cuisine that keeps on evolving, inside and outside of Mexico. So tune in!! And please, keep on sharing what you like and what you don’t, and mostly: send me your requests, I will try to keep on honoring them all. p.s. The series premieres on WETA TV 26 Saturday April 2nd at 11:30 am in DC/MD/VA. Check your local public television station for their schedule this Spring! 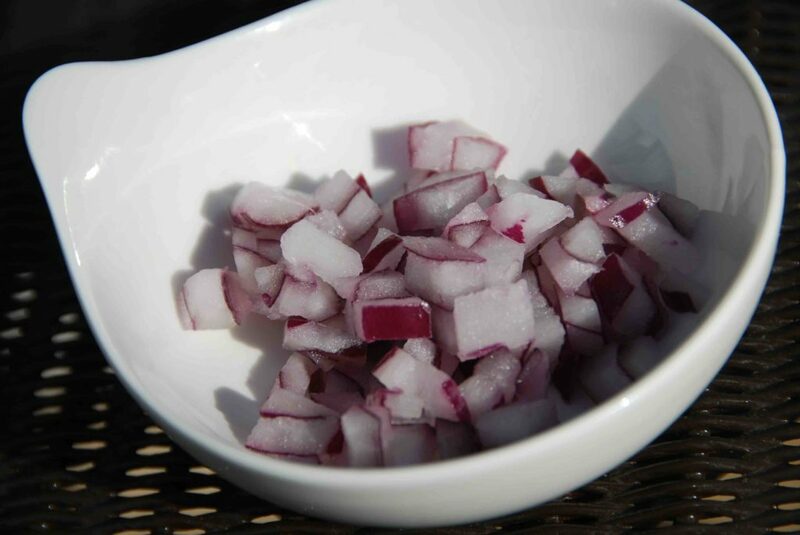 To make the vinaigrette, pour the vinegar and lime juice in a small bowl. Add oregano, salt sugar and black pepper. 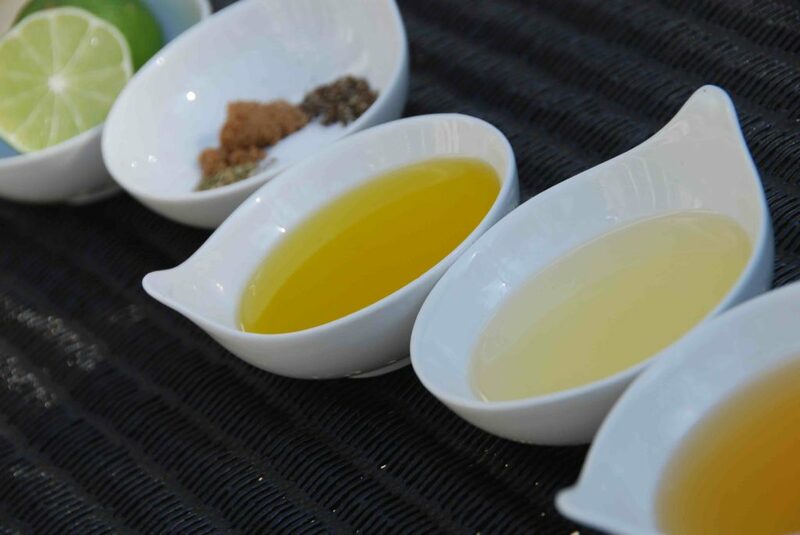 Pour the oils in a slow stream, whisking with a whisk or fork to emulsify. The vinaigrette can be made a day ahead of time, just emulsify before using. To toast the pumpkin seeds, place them in an already hot small saute pan, set over medium heat. Stir often, being careful not to burn them, until you start to hear popping sounds (similar to pop corn), and they begin to acquire a nice tanned color, about 4 to 5 minutes later. Remove from heat and place in a bowl. In a separate bowl, gently mix the avocado chunks, hearts of palm slices, corn kernels, cherry tomatoes and red onion with the vinaigrette. Sprinkle with the toasted pumpkin seeds and serve. This salad can be served as a main salad with a side of toast or pita bread, or it can be served as a side salad to grilled chicken, fish or meat. I love your show!! I’m 65…and my 1st husbands parents were born in Mexico…so I learned to make and love the foods. You are sooo emotional when you talk about your recipes that I just know they are all delicious. I also absolutely love your theme song and find myself singing it at odd times..haha.I hope to find it online and buy it so I can learn all the words! Much continued success!!!! Hola Alice, Thank you for writing to me! I’m so happy hear you enjoy the show. Maybe you will try a few of the recipes for your husband sometime? The theme song is “Dame” by Domingo Siete – hope this helps your search. All my very best to you. love the show and love the theme song Please send me the name of the theme song, I will greatly appreciate it. Hello May, The theme song for my show is “Dame” by Domingo Siete. Came upon your show after one o’clock am being wide awake and watching “Create” here in Boston. My sister lives in Glendora, California. Is there a channel that she can get your show on any of their Public stations? She used to love Mexican food. I think your program will get her mouth watering again. I just wanted to let you know that I love your show! I am as “whitebread” as they come but your recipes are sooo easy and look fabulous! I also love that you are always so happy to share your cooking with us in tv land. Thank you so much for sharing your positive attitude and gift of good cooking with us all. May God bless you with continued success and hapiness! Que gusto toparme con tu programa. Vivo en Seattle WA desde hace año y medio y mi esposo siempre me ha pedido que le cocine mexicano. Ahora sé que tengo un blog y/o programa en el cual apoyarme y que me guiarÃ¡ paso a paso para lograr un autentico platillo mexicano. Me encantó ver el Parque Polanco en el show, me trajo muchos recuerdos! Ahora estaré pegada al televisor todos los sÃ¡bados a las 8 pm. I just saw your show for the first time a few weeks ago here in Baton Rouge. I love Mexican food! I saw your recipe for flan. I can’t wait to try it. If I lived in DC I would be in your classes all the time. I’m vegetarian and gluten-free, so the flan was exactly something I could do and I’ve wanted to try for a long time. The orange twist sounds so yummmmy! I can’t find TV schedule for Raleigh Durham area… PBS. It use to come on PBS UNC, Saturday or Sunday afternoon…. Thank you! Hi Pati! Just saw the show today and loved it! We also just finished making the chop chop salad. It tastes incredible! Thanks! I just saw your show for the first time this morning, and I LOVE it! I finally got a chance to see your show and I loved it. I’ve been following your blog for several months and have really enjoyed the recipes. I made the Avacado Chop salad last night and LOVED it and so did my guests. I will make it over and over again. My family loves the Chicken Tingas too. I’m watching your program on PBS right now! Within the first 5 minutes I had to go online to look up your recipes, and I’m now adding the ingredients to my grocery list. I can’t wait to try my hand at preparing your dishes tonight, and I look forward to seeing much more of you on television! Thank you! Hi, Pati. I just saw your show for the first time on WTTW in Chicago and I loved it so I got on your website. I am a big fan of avocado, cilantro and coconut so I enjoyed today’s recipes and can’t wait to make them. Maybe I can become a Mexican cook?! I liked your can-do approach and cheerful attitude and look forward to seeing more episodes. Good Luck to you! Of course you can become a Mexican cook! Just start cooking Mexican in your kitchen! It’s so nice to hear that you are enjoying the show! Congrats on your show. How about playing Mexican music for your background music? It sounded more South American/Puerto Rican, which I also love, but it is not authentic Mexican. Loved stumbling into your show today! I fell in love with palmitos in Brazil many years ago (favorite was in pastéis, of course) and had them in some fashion almost weekly for a while but not recently. Now I can’t wait to try your salad, the avocado martini… and probably whatever you come up with next. Thanks and I wish your new show long life! Loved the show. Enjoyed the side-trip to La Michoacana. If only we had one here. Off to the store to get some hearts of palm. Congratulations on a great cooking program. Pati, I just caught the show on NJN, and it was so great! I can’t wait to make the Chop Chop salad, but I think I’m going to need to satisfy my guacamole fix first! Felicidades! I will be watching and I’ve bookmarked this website. Me encanto tu programa! Realmente un show de mucha calidad, interesante, entretenido y muy informativo. Muy completo. Te felicito de corazon. Just read about you in WaPo. The story was fun and delicious. Can’t wait. Good luck! When you husband told me the good news about your show, I was excited for you. I have my DVR set. Congrats! I love PBS and I love your blog. This is a marriage I can appreciate! I have been reading your blog for some time and just love everything about it. I cannot wait to see your show! Congratulations and all the best! Wow congrats! Can’t wait to see the show. Best wishes! How awesome is that? Congratulations! On your way to celebrity chefdom now…I just know people will love your show – you’ve got such an infectious enthusiasm. Even people who don’t usually cook will want to try. Looking forward to the premiere! I’ve enjoyed your blog from the get-go and I will record your cooking show. Any chance for my family and I to learn “inside tips” about preparing authentic Mexican cuisine is most appreciated. We love Mexican food. I am so glad you discovered my blog and so happy you liked the salad (!) I hope you will try many more of the recipes. If you are in DC, and craving more Mexican food, I hope you will jump in to one of the classes, I can give you great Mexican food and lots of it… Very best, Pati. Mil felicidades Pati, el éxito a diferencia de lo que nos hacen creer no es algo que sucede asi por nomÃ¡s. No. El éxito (cual sea el concepto que se tenga de él) se trabaja y *se suda* todos los dÃ­as. En tu caso se ha cocinado con mucho amor por tu trabajo, recetas deliciosas y el apoyo de una hermosa familia. te mando un abrazo ENORME Pati!!! ps2 y los que vivimos tras fronteras, cómo le hacemos para verte? Pati, Mil felicidades!! a request: sopa de tortilla!!!! Your show will be great, as your blog is!! un abrazo. Te felicito mi amor. Estoy muy orgulloso de ti. Te quiero mucho y te mando muchos besos. Si publicas este post di que es de un admirador secreto! Mi marido: Admirador secreto. Que suerte! Gracias mi amor. Pati, muchas felicidades. Tu programa aparecera cada semana? Congratulations. You are an amazing food ambassador. I know your PBS show will be a huge success because of the way you present a bit of history and charm with every dish. A very big congratulations and mazel tov on going on to National Public Radio. You are our favorite celebrity chef!! How are the boys and Danny? Please send our love to them. We would love to see you the next time we are in DC to visit Jason. We wish you wonderful success in this very big accomplishment. I am so happy for you Pati. Will you still cook for the Institute? I hope you continue having classes as well. When will we know when it is showing in the DC area? Pati, I am so happy for you and so excited to watch your new show. I also can’t wait to try this simple, healthy, colorful and delicious salad, it’s right up my food alley. Hooray! Thank you Domenica! Same to you, always. I am still thinking about that mushroom sauce… Yum! And it’s funny: since I’ve met you, I read all of your tweets and your posts while hearing your voice (does that make sense?). Thank you! It was a treat to meet you in the Moles of Oaxaca Class, thank you for coming! 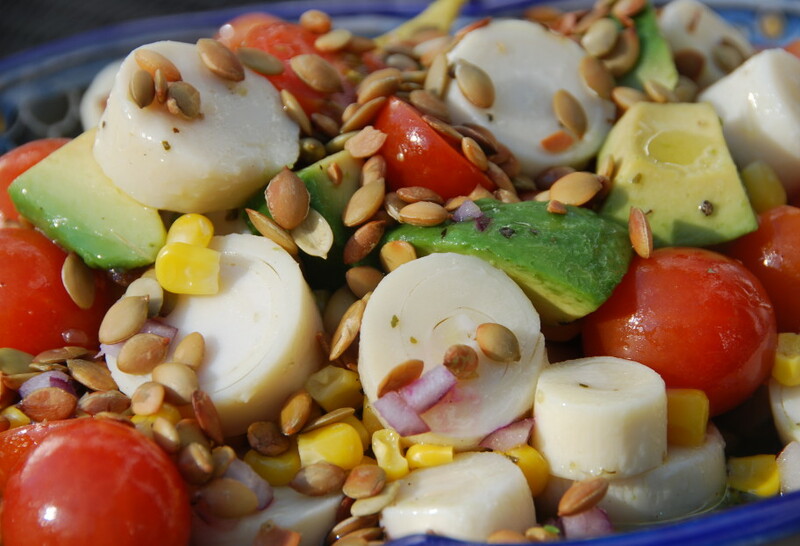 I also hear you in your tweets ; ) Try your hearts of Palm in this salad, I hope you like it!